After it was released on mobile where it was well-received, Aquiris decided to bring Horizon Chase to new platforms as Horizon Chase Turbo. The arcade racer takes inspiration from the likes of Outrun, Top Gear, and Lotus Turbo Challenge. There are 12 cups, 48 cities, 110 tracks, 26 unlockable cars, and 10 upgrades. That’s on top of an Online Competitive Ghost Mode and split-screen multiplayer. 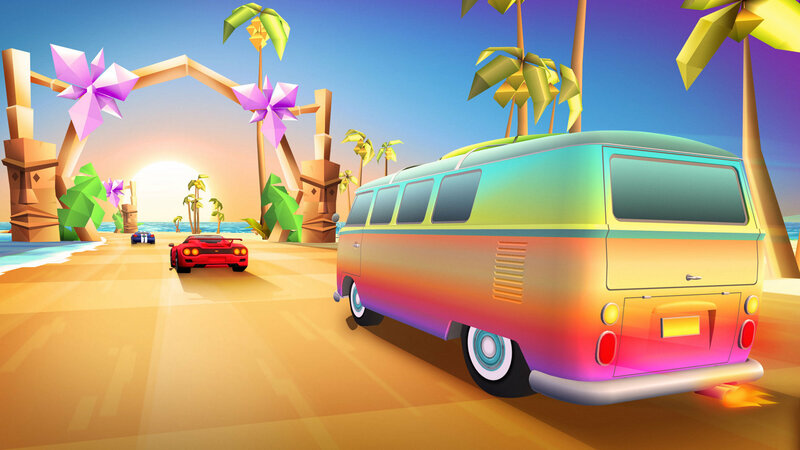 We have some additional information for Horizon Chase Turbo plus a trailer below. Horizon Chase Turbo is a racing game inspired in the great hits of the 80’s and 90’s: Out Run, Lotus Turbo Challenge, Top Gear (SNES), Rush, among others. Each curve and each lap in Horizon Chase Turbo recreates classic arcade gameplay and offers you unbound speed limits of fun. Full throttle on and enjoy! Horizon Chase Turbo presents Barry Leitch, the musician behind the soundtracks of classic arcade racing games Lotus Turbo Challenge, Top Gear (SNES) and Rush. As you play the game, you’ll be hypnotized by his charming tunes that complement the graphical ecstasy of each horizon. Horizon Chase Turbo is the new version of the acclaimed and multi-award winning game “Horizon Chase World Tour”, selected as “BEST OF 2015” having a Metacritic of 88. (It) brings a lot of unseen features and content that enhance the nostalgia of the old-school arcade racing games.